Reading, as I do, so much about the markets and the people who populate them, it never ceases to amaze me that almost without exception traders get “married to an idea, a style or a methodology”. I’m a short-term technical scalper! No, I’m a medium-term trend follower! Well I am a long-term investor; all that short-term stuff is just noise! As you all know, at least you should if you read this stuff regularly I “cut my teeth” trading in banks. That teaches you one thing; making money is all that matters no matter how you do it. I think that isolation is the retail trader’s worst enemy. It is easy to start down the wrong path particularly if you are initially successful and then when things start to fall apart blame something other than the fact that the original premise was wrong. Most traders operate in a bubble and that is the single differentiating factor from a bank’s dealing room. I wouldn’t advocate “throwing the baby out with the bathwater” every time things go a bit awry but accepting a more “balanced approach” is never wrong. Look at every way you possibly can of making money from day one. Look at every opportunity as it presents itself. You never know scalping may just work for you. Or Trend following. Or you may just see that all that noise is, well just noise. Labour day approaches and traders are drifting back from vacation. The market is going to start to pick up the threads of the major influences, re-plot its charts and look forward to a fourth quarter full of volatility and hopefully predictability. Since global growth isn’t particularly strong, especially in G20, Canada and the U.S. apart interest rates are firmly on hold. Yet the fundamental guys still hanker after a surprise. Messrs Carney and Draghi will be bringing out the old “read my lips” mantra to convince the market they are serious. So, do we dismiss Central Bank Meetings? At our peril! We still have the roll-back of “extraordinary measures” to consider. Ahhhh Brexit. I’m starting to love the whole idea. Not actually Brexit as I have changed from a leaver to a closet remainer. I’m not too keen on the Federal Europe idea but as all twenty-seven members have sleepwalked into this whole four freedoms gig, being inside the tent looking out is better than being inside the tent looking in. For those of you familiar with that expression, I have used the word “looking” to ensure that I don’t fall foul of anyone’s sensitivities. Of course, there are those, and I salute you, who ignore everything about politics and monetary policy and concentrate on moving averages, Fibonacci and trend lines. I imagine two tents, one full of fundamentalists (in a trading sense) and one full of technicals hurling abuse at each other like East and West Germany pre-1990. Look at how things went when the wall came down. A lesson to us all! 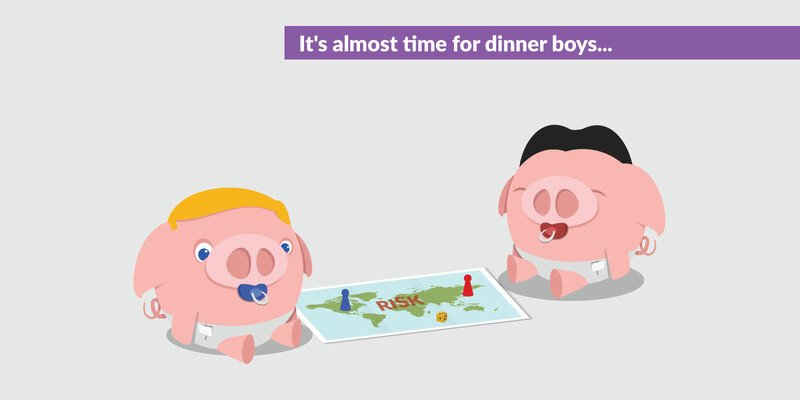 It’s like a game and then Mummy Kim and Mummy Trump called their boys in for their dinner and they put their toys away for another day. Trump and Kim, the most anguished love/hate relationship since Burton and Taylor! Kim has found the perfect person to aggravate knowing that he will always get a response just short of a first strike. Trump can use Kim as a diversion when things get a little rough at home. In reality, Kim probably opens his dealing platform sells a chunk of dollar yen then goes back up from his basement and threatens Guam.